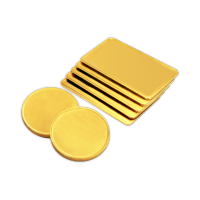 Assortimento di articoli in oro 1/2 oz A great investment for your portfolio, the 1/2 oz assorted gold is a terrific value. As you've come to expect from us, weight and purity are guaranteed on each piece, and all products are produced from well known, reputable mints. You will receive our choice of available product depending on current stock. This product may include (but is not limited to) coins, rounds or bars.